The bag was the first thing I added to my cart when shopping on RTR. 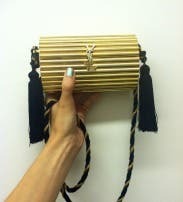 I was very exciting to have a YSL bag on my shoulder for the Beyonce concert. Once the bag arrived I was very disappointed. The strap of the bag was very short. I couldn't wear it as a crossbody because it looked very awkward and when I wore it on my shoulder it would instantly roll off so I ended up tucking it under the strap of my dress. I was also disappointed by the size of the bag. It was only big enough to fit my phone lipstick and two credit cards. It also didn't have a latch so every time i would start dancing it would pop open and I would be scrambling to pick everything up. I ended not even using the bag by the end of the night. The only reason I gave the bag two stars is because its a vinatge ysl....so beautiful...but so unrealistic for a concert. LOVE the 70's vintage vibe. Big enough for a lipstick powder compact and cell phone. It really gave some pizzaz to my chic but plain black halter gown. Almost a piece of jewelry! such an amazing statement bag! Super dramatic and art deco inspired, with a silk cord strap and huge tassels! This bag is a little on the smaller side and can still fit a lot. Love this for any going out or super formal look where you want a bag that will earn you millions of compliments!